The cross formed by the cloud is written about in Isaiah chapter 53, which tells about the death of Jesus in detail 700 years before He was born. On the left arm of the cross in the photo is the profile of a head looking down with a crown of thorns on top. Part of the head has another face looking at a slight different angle. To me this could represent Jesus who is God and Man through the virgin birth. At the bottom of the cross to the right is a head of a lamb or sheep similiar to the full figure one sitting on the right shoulder of the cross . 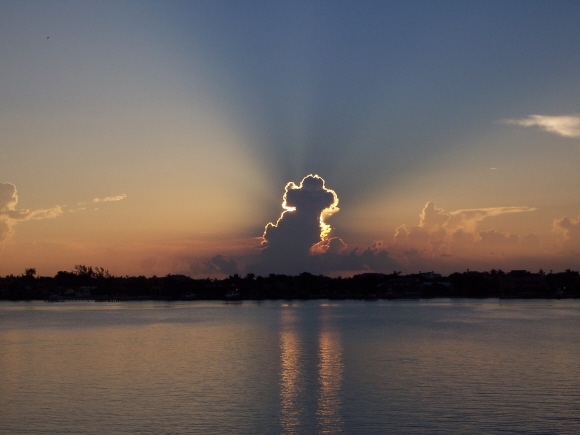 The bottom could signify the resurrection of Jesus and the other is Jesus sitting on the right hand of God in heaven. 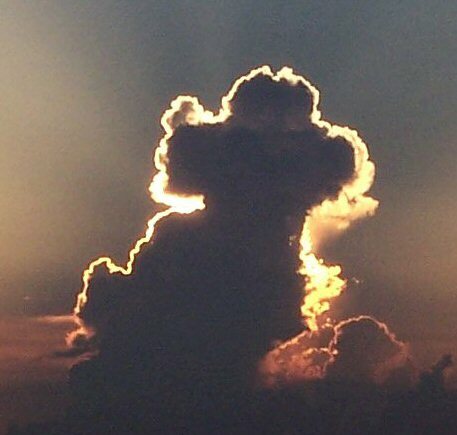 I think it is remarkable that the cloud formed into a cross, even more that the face and lamb like figure is present. Was it formed by God? I know one thing, if you have gotten this far reading this, God has some good news for you no matter what situation you are in. "God so loved the world that He gave His only begotten Son, that whosoever believes in Him shall not perish but have everlasting life". John 3:16. Why did Jesus have to die in our place? We are all born with a sin nature. Romans 3:23 "All have sinned and fallen short of the glory of God." Romans 6:23 " The wages of sin is death(hell), but the gift of God is eternal life." Can you be good enough to get to heaven? Isaiah 64:6 " All of our righteousness are as filthy rags". Many verses in the Bible say you cannot get to heaven by doing good works. Ephs 8 & 9, Romans 4 :5, and 3:28 are just a few. God is a loving God, but at the same time a just God that has to punish sin. He doesn't want anyone to be damned and punished in hell for eternity. That is the reason He sent Jesus to die in our place on the cross. He took all our wicked sins on Himself, while he was sinless. He paid the penalty for our sins and purchased us a place in heaven. By rising from the dead, He defeated the devil and death forever. What do you have to do to receive this free gift of eternal life? God has done everything for us. "God commended His love toward us that while we were yet sinners, Christ died for us". Roman 5:8. We can't clean ourselves up, but He can by forgiving all our sins. First you have to Repent. Jesus said many times that " repent or likewise perish". This means to have a change of mind or direction. Turn from sin and self to God so He can convert or change you to be a part of His family. Jesus said you must be born again, which means born again spiritually, where His Holy Spirit can dwell in you. Romans 10:13 " Whosover calls on the name of the Lord shall be saved." Romans 10:9 "That if thou shall confess with thy mouth the Lord Jesus and believe in thine heart that God has raised Him from the dead, thou shalt be saved." If you want God to forgive you of all your sins and remember them no more, call on Him. Confess to Him that you are a sinner and you are sorry for your sins and ask for His forgiveness. He will give you a peace and joy that the world system can't give you. Jesus said "I stand at the door and knock, if anyone hears my voice and opens the door , I will come in." I plead with you to invite Him into your heart as your Lord and Savior before it is too late. The photo of the cross is reflected in the waterway below. Jesus told the sinful woman at the well that He could give her water to drink and she would never thirst again. John:1:12 "All those that receive Him(Christ), He gives them power to become the sons of God, even to them that believe on His name". Revelation 22 at the very end of the bible, Jesus said "and whosoever will, let him take the water of life freely."